George passed away at his residence with his family at his bedside on February 5, 2019. 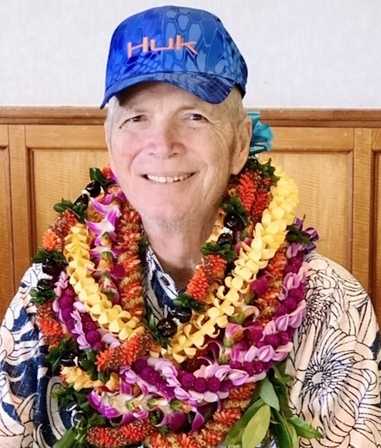 He was born on June 15, 1937 in Honolulu and graduated from Saint Louis College in 1955 and attended the University of Hawaii. He worked as a Honolulu firefighter and a pilot for Hawaiian Air before joining the Hawaii Air National Guard 199th Fighter Squadron as a F 102 jet pilot. He was proud of their mission to protect the Hawaiian Islands. He also flew fighter pilot missions in the Philippines and Vietnam. After his retirement from the military George became the U.S. Coast Guard Safety Officer in Hawaii. George enjoyed many hobbies such as making model planes and trains. He was a member of the Oahu Train Society. He played volleyball, tennis, golf, and baseball and spent time with his Senior friends as often as he could. George is survived by his wife Maggie (Margaret), two sons, Vini (Darlene) and Jim, a daughter Debbie (Michael) McBirnie; seven grandchildren: Kaimana, Sierra, Kanaloa and Lokahi Joy, Pono, Kealani and Lilinoe Keni: three great grandchildren: Malosi, Maverick and Iokua. Also survived by brother Elia Joy and sisters Mahealani Huber, Michelle Spaeth and Yvonne Thompson and two Aunts, Mona Joy Lum and Louise Moniz and numerous nephews and nieces and their relatives. Celebration of Life service will be held on Saturday, March 30, 2019 at the Waipio Mililani Mortuary, Mauka Chapel. Visitation: 5:00 p.m.; Service: 6:00 p.m. Internment Service: 11:00 a.m. on Monday, April 1, 2019 at the Hawaii State Veterans Cemetery, Kaneohe.